A LONELY LITTLE boy who is scared of the dark sits in his room alone, with only light for company, until a little girl named Dark appears and shows him that light switches don’t just switch off the light—they switch on the night. And to switch on the night is to switch on the stars, the moon, the crickets, and the frogs. 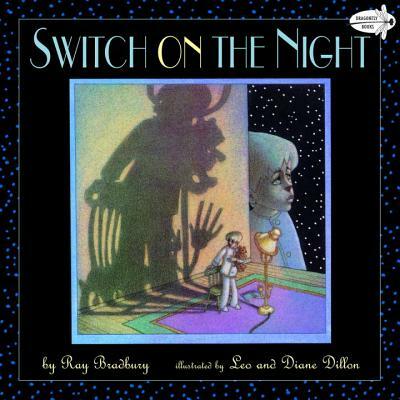 With the Dillons’ dreamlike illustrations, Switch on the Night is sure to reassure any child who has felt afraid of the unkown; the story will also impress adult readers with its imaginative approach to understanding that which is different. Ray Bradbury, the famous science fiction author, wrote this story in 1955 to help his own son overcome fear of the dark. The author lives in Los Angeles, CA. Leo and Diane Dillon have received two Caldecott Medals and a Coretta Scott King Award for their distinguished illustrations. "[The] story has that vivid sense of magic that infuses all of Bradbury's poetic writing. The illustrations enhance this otherworldly mood. . . . [A] gem, visually appealing in art and design, strongly atmospheric, and founded on an ingenious strategy for coping with a common fear."